Kenji Sonishi's Neko Ramen is definitely one of the best book series I read. I enjoy it on a daily basis. It’s about a cat named Taisho who owns a ramen shop. He has one frequent customer named Tanaka. Taisho is constantly creating different sorts of unusual ramen and having Tanaka test them. On top of that, Taisho hires more part timers than he can count, and most of them don’t do much. There’s Mi Chan who sleeps all day. There’s Shige who steals from the cash register. There’s an elder named Toku who is paid with glasses of milk. There’s the second location guy who runs the second location. There’s Maru who’s a chicken. Finally, there’s a bunch of prairie dogs. Taisho’s father is the complete opposite of Taisho. While Taisho is a middle class ramen shop owner, his father is a rich and famous cat model who makes $1,000 a day. 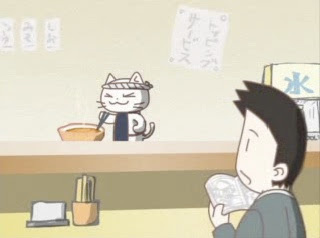 Taisho ran away from home when he was a kitten and tried many occupations until he settled down with ramen. A scene I liked was when there was a sign for a new ramen dish called “All Fried Chicken Ramen". Tanaka thought Taisho had fried Maru, but it turned out that Maru cooked the ramen. The artwork in Neko Ramen is very simple. It appears to be drawn with a pen alone. It has a large charm to it. If you like complex art, this is not for you. Great review, Milo. Makes me want to read the series! bro - this is a great review. I love your phrase "large charm"! Keep the reviews coming! Reading your post, I feel like I would identify most with Taisho's father because Taisho's father is a super model and I am also a father and unusually good looking. Hi Milo! I think I might get this for my kids for Christmas. Have you read them all? Do you have any other recommendations for an 8-year-old and 4-year-old (he can read) who like kitties and funny, cute graphic novels without violence or superheroes? They really like Peanut Butter and Jeremy (http://www.amazon.com/Peanutbutter-Jeremys-Best-Book-Ever/dp/1891867466/ref=sr_1_1?ie=UTF8&qid=1353457800&sr=8-1&keywords=peanut+butter+and+jeremy) and the older one likes Little Vampire. Yeah. you can totally get it for a 4 year old. Good review, GN! It sounds very interesting to be a ramen shop owner. Next time I'm in a Japanese restaurant, I will secretly know that things are even more intriguing than they seem! My two girls love stories with animals as the main characters. Have you read the graphic novel version of "warriors"? Great series!